The success or otherwise of a film musical depends totally on the quality of the music and lyrics which are featured on it. On this album Geoff Love has selected the best-known and most successful songs from the dozen most prominent film musicals of the last decade and has added his own unique brand of arrangement to each of these items to provide an indispensable collection of Big Musical Movie Themes. Marvin hoisted high into the best-selling singles charts. bidding of our compelling Master of Ceremonies and "leave our troubles on the doorstep" as we enter and come under the spell of the cabaret. Since Burt Bacharach and Hal David teamed up in 1957 they have written 192 songs together, but surprisingly their score for the film "Lost Horizon", which was chosen to feature in the Royal Film Performance of 1973, marked the first occasion on which they had composed a complete screen musical. It is the title theme that Geoff Love has chosen to play on this occasion as he invites us to take a musical journey to Shangri-La. first conceived it in the context of the enormously successful "Oliver". 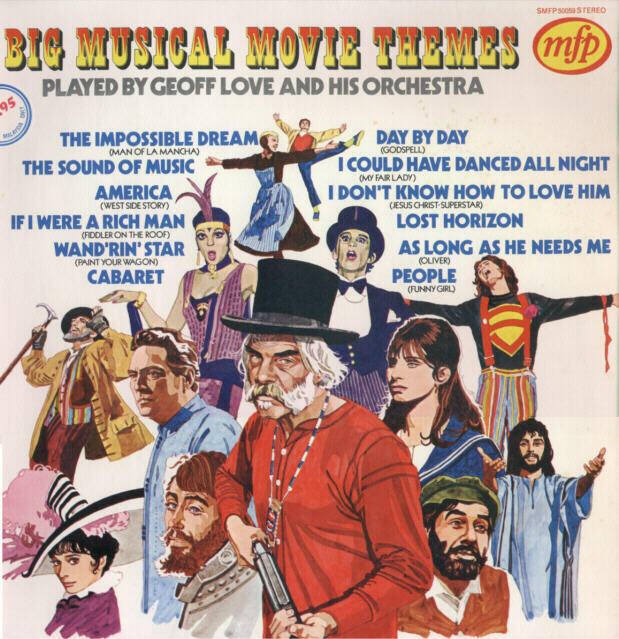 All the themes played here by the Geoff Love Orchestra owe a large part of their popularity to big musical film productions. Individually they stand out as major compositions in their own right, collectively they form a superb tribute to the music of the cinema by this country's most consistently popular orchestra.